At both the blog of my friend Fr. 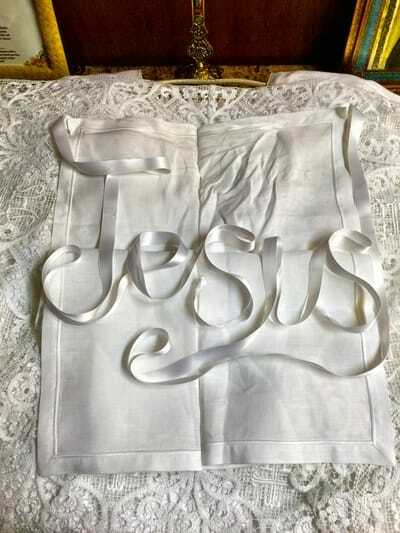 Jeffrey Keyes (Beauty Evangelizes … so true) and repeated at NLM there are photos of how the sister who sets up Father’s Mass vestments in the sacristy arranges the ties of the amice. She is wonderfully creative. Her attention to detail reveals true love. I’m a little envious. By the way, the Sister … or perhaps Sisters?… who did this are of the wonderful Marian Sisters of Santa Rosa. They are a relatively new foundation and faithful, beautiful sacred liturgical worship is one of their core means of service. NLM mentions “It’s the little things”. This is indubitably true. I have long maintained that our sacred liturgical worship creates ripple effects in the cosmos (as do our own actions). Even the smallest acts of preparation for Holy Mass, performed with piety in accord with the virtue of Religion also create their own knock on effects. This entry was posted in "How To..." - Practical Notes, Just Too Cool, Liturgy Science Theatre 3000, Mail from priests and tagged D. Santa Rosa, Fr. Jeffrey Keyes, Save The Liturgy Save The World. Bookmark the permalink.